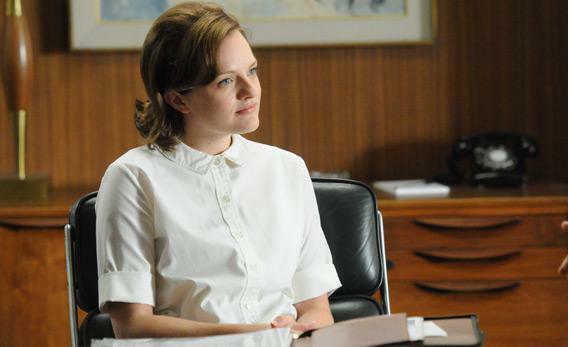 Mad Men Season 5: Has Betty ever been this unlikable? Has Betty ever been this unlikable? Now we know why Betty was MIA last episode: She had an appointment with Peggy’s makeup artist from Season 1. Yes, it’s true, in real life January Jones was pregnant and had a baby (a mystery baby!) recently. But as Betty’s doctor leaned in during tonight’s episode and started prodding her prosthetic jowls, I had a terrible (albeit period-appropriate) flashback to Leonardo DiCaprio as J. Edgar Hoover. I don’t know about you two, but that left me kind of hoping Betty was terminal. I’d love to hear predictions from you two about Michael’s future at SCDP. Did you share my impression that what really won him the job, in the interview with Don, was his suggestion that he wants to be a part of the firm because he thinks it’s “on the way up”? There is so much more to chew on: Don’s new secretary—Dawn!—and Harry Crane’s suggestion that the similar names might lead people to mix her up with her boss. (“People keep saying that, but we haven’t had any problems…”) Don’s decision to wear a suit and tie to the Stones concert. Harry’s clandestine munchies. And my favorite: Henry’s dig at Mitt’s dad, George Romney, who was running for re-election as governor of Michigan in the summer of 1966, and would soon be seeking, ahem, the Republican nomination for president. Why don’t we try again tomorrow. Asbury Park?